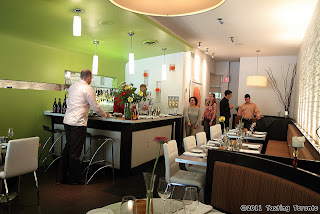 We recently had a chance to check out Bloom Restaurant's new menu. The restaurant's philosophy is to be an extension of your family, rather than being "the stuffy aunt who visits once a year." While being chic, it also felt like a family-friendly space too, and they have a kids menu too which I'm sure parents appreciate. We're not out in Bloor West Village often but we really enjoyed our time there and since we love walking around the city, we spent some time exploring the area and relaxing on a bench that one of the local businesses had sponsored (maybe I'm a weirdo but I'd say there are an abundance of benches compared to other neighbourhoods we frequent! Seriously! So many places to rest your weary feet and many shops to explore). The restaurant itself was at Bloor and Windermere, about equal distance between Jane and Runnymede subway stations. Cassava frites - what a smart idea! Never have I had cassava in the form of fries. Cassava is a starchy tuberous root popular in tropical climates - though be careful, if not cooked properly it can make you ill! I've had cassava cake quite often, since it's a Filipino recipe. But I've got to say cassava in the form of fries was a very, very pleasant surprise! Note: This item doesn't appear on their online menu, so I'm not sure if they offer it on the regular. The chimichurri sauce on the pan-seared flank steak was to-die-for. Chimichurri is basically a sauce made from chopped parsley, minced garlic, vegetable or olive oil, white or red vinegar and red pepper flakes (although there are variations with added ingredients). Flank steak is known to be a bit tougher than other cuts of meat no matter which way you slice it, but boy oh boy, that chimichurri sauce made up for that! The Malivoire 2008 Icewine Riesling VQA was a truly delicious dessert wine to end the night with. It's no secret that I love icewine, and this was one of my favourites. Note: All wine pairings that night were Malivoire, so again I'm not sure if they keep this specific icewine on the regular. Check out our full set of pics or watch the slideshow above. Thanks to Sizzling Communications for the invite! My grandma used to serve it with her ketchup/mayo sauce...Mmmmmm! I love this blog.This is really a great post i love it. Thanks for some other informative web site. Where else may I am getting that type of info written in such an ideal means?